Hiram Bingham was the ideal explorer-adventurer—handsome, rich, intelligent, brave, and tough. His life seems like something out of film hero Indiana Jones’s exploits in Raiders of the Lost Ark. The descendant of strong-willed missionaries, Bingham was born in Hawaii in 1875, At Yale he specialized in South American studies and became a college teacher. Gradually, the romance of the past took hold of his practical soul. Obsessed by the Incas and his dream of uncovering lost cities, Bingham initiated and expedition to Peru that would lead him to uncharted territories. 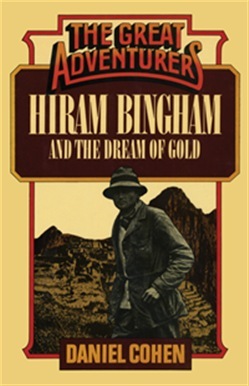 Using quotations from Bingham’s accounts, Cohen describes how in 1911 Bingham made the greatest archaeological find of the century, the rediscovery of Machu Picchu, the abandoned Inca city in the remote Peruvian mountains. On later expeditions he discovered other lost cities, as he continued his research on the mysteries of Machu Picchu and the last of the Incans, despite the physical hardships and dangers of exploration. When World War I broke out, Bingham learned to fly—no small accomplishment in those pioneering days of aviation. He eventually joined the American forces in France as head of the largest Allied flight training base in Europe. After the war, the ambitious and restless Bingham entered a new career, politics, and was elected senator from Connecticut in a landslide victory. But he was too proud an individualist to do well in government. Bingham spent the rest of his life writing and lecturing. Bingham led the kind of action-packed life that most people only dream of. Daniel Cohen has written a story sure to capture the imagination of everyone who likes history enlivened by cliff-hanging adventures. Acquista Hiram Bingham and the Dream of Gold in Epub: dopo aver letto l’ebook Hiram Bingham and the Dream of Gold di Daniel Cohen ti invitiamo a lasciarci una Recensione qui sotto: sarà utile agli utenti che non abbiano ancora letto questo libro e che vogliano avere delle opinioni altrui. L’opinione su di un libro è molto soggettiva e per questo leggere eventuali recensioni negative non ci dovrà frenare dall’acquisto, anzi dovrà spingerci ad acquistare il libro in fretta per poter dire la nostra ed eventualmente smentire quanto commentato da altri, contribuendo ad arricchire più possibile i commenti e dare sempre più spunti di confronto al pubblico online.